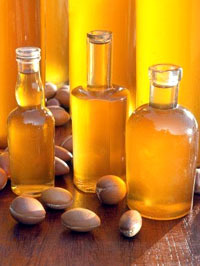 What are the nutritive qualities of Argan oil? As has been mentioned above, Argan oil is rich in essential fatty acids and vitamin E. The limpid (fat) component of Argan oil is divided into the following fatty acid types: Saturated (16-20%), Monounsaturated (45-50%), and Polyunsaturated (32-40%). There is also a significant concentration of oleic acid and omega-6 fatty acids. Compared to olive oil, Argan oil is about equal in saturated fatty acid content, lower in monounsaturated fatty acid content, and high in Polyunsaturated fatty acid content. The distinction between saturated, monounsaturated, and unsaturated fatty acids is important. When consumed and stored in the body, saturated fatty acids are prone to stack neatly on top of each other and therefore form a lining in the interior artery wall that, if allowed to accumulate, will eventually clog the artery. Monounsaturated and polyunsaturated fatty acids do not stack in this way, and, therefore, they are less prone to cause artery blockage. Monounsaturated fatty acids, when consumed instead of saturated fatty acids, are capable of reducing unessential cholesterol and maintaining essential cholesterol. Polyunsaturated fatty acids have the same tendency to remove cholesterol, but it removes all cholesterol, regardless of its essential or unessential qualities. Polyunsaturated fatty acids, however, are the essential material of the outer walls of the cells that compose the body. Argan oil contains, in small amounts, other fatty acids, such as linoleic acid, that produce prostaglandins, which are key in immune system and circulation functions. Consumption of linoleic acid will lead to an increased production of prostaglandins, which helps with rheumatoid arthritis and problems of the cardio vascular system. Because Argan Moroccan oil is processed using a cold press – that is, it is not heated – it retains a much larger amount of its natural nutritive qualities than oils pressed using a heated process.